“I had been pleased with the newly bought Popcorn Hour C-200 until I ran into issues when playing back WMV videos. As a PC guy, I saved a lot of video clips in .wmv format, but the so called universal HD media player refuses to play my WMV videos! What’s wrong with it?” If you are involved in the same WMV playback issues with Popcorn Hour C-200 or A-200, try converting your WMV to VC-1 (WMV 9) encoded files. The Popcorn Hour NMT plays WMV files that encoded with VC-1 only. WMV8 and earlier WMV codec are not supported by Popcorn. That’s why you need to convert these files to VC-1. 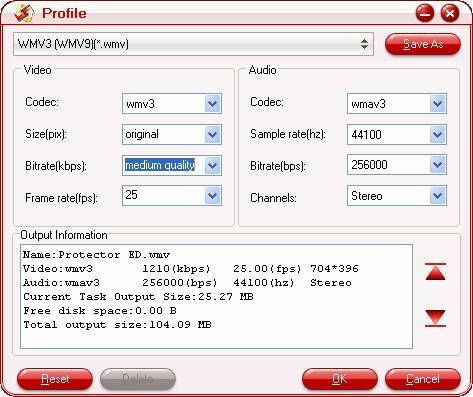 The following guide includes full conversion of WMV to VC-1 with Pavtube Video Converter. Hope this helps you out. Download a free trial of the Video to Popcorn Hour Converter and here we go. Step 1. Load WMV to the Pavtube Video Converter software. Have the Pavtube Video Converter installed on your computer. Run the app and click “Add” button to load source WMV files. The converter works with WMV files encoded with WMV8, WMV7, WMV3, WMV2, WMV1 and supports batch conversion. So just load your WMV files to the converter. Step 2. Select Popcorn Hour NMT optimized codec and format. Click on the “Format” bar and find “Common Video” group. 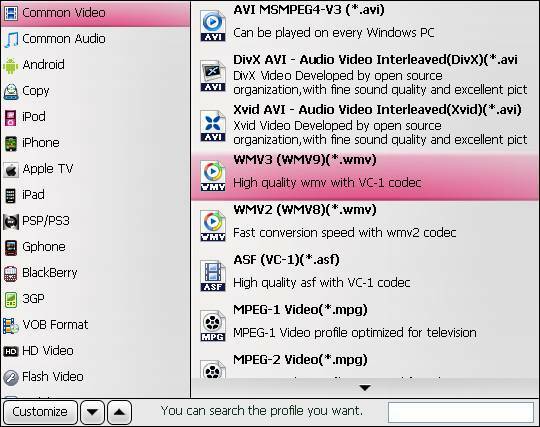 For WMV to VC-1 conversion, you may select “ WMV3 (WMV9)(*.wmv). The format creates WMV9 ideos in high quality and perfect sync. Apart from VC-1, there are other codecs like MPEG-2, H.264, DivX, which also plays well on Popcorn Hour. Step 3. 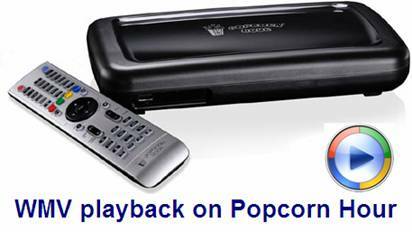 Convert WMV to VC-1 for Popcorn Hour HD media player. Click “Convert” to start converting WMV to Popcorn Hour NMT customized VC-1 files. When the WMV to VC-1 conversion completes, click “completed”, back to the Pavtube Video Converter interface, and click “Open” to find converted WMV HD videos for streaming to Popcorn Hour NMT. 1. In order to avoid quality loss when converting WMV to Popcorn Hour NMT videos, you may set a higher bitrate before conversion starts. Simply click “Settings”, find “Bitrate” in Video column, and set it to “high quality”. Or you may type in a bitrate the same with original video. The “Profile Settings” panel provides you detailed information of source and target video file. 2. To maintain 5.1 surround sound, you may click “Settings” and select “5.1 channels” in the drop-down list of Audio Channels. 3. The trial of Pavtube Video Converter produces video with a Pavtube logo on the screen and you can purchase a license to get rid of the watermark. 3. You may also put Blu-ray and DVD collections to Popcorn Hour A-200/ C-200 with Pavtube Blu-ray Ripper software. How to convert TiVo to MPEG with TiVo to MPEG converter?